Until the 1990s, when it became possible to access and analyse DNA directly from the environment, the study of microbiology was limited to studying those microbes that were able to be grown in artificial culture. The advent of DNA-based methods provided a way to access and study the enormous diversity of microbes that actually exist. Some fields of microbiology were quicker to take up this technology than others. Microbiological analyses carried out in industrial settings have, although this is changing, remained culture-based because they are standard methods required by regulators. They tend to be technically straight-forward and inexpensive. 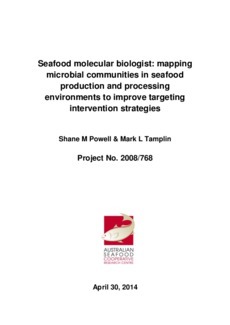 The goal of the Seafood Molecular Biologist was to apply DNA-based techniques to a range of existing problems within the seafood industries. The three projects developed covered shellfish aquaculture, the processing of Atlantic salmon and supply chains in the wild prawn fishery. Due to the varied nature of these projects, they are treated separately in this report.